Looking to have something translated really quick and for free? Now you can: use our free translation tool online. 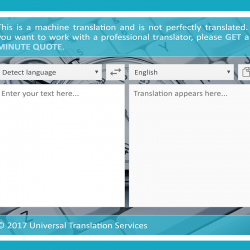 Universal Translation Services is proud to present you our free translation tool which you can use on our website, or you can download our translation extension for Chrome and use it on your computer whenever you like! If you prefer using Firefox and you are browsing various sites in other languages where you need to have translation, use our free translation addon for Firefox below to translate any text, from and into any language, at any time, totally free. Simply download the add-on and an icon will show up on your Firefox toolbar, click it any time you need translation, it’s that easy! For those of you who prefer to use the Chrome web browser and need a free tool to help them with any translation of any text, our translation extension for Chrome does exactly that. To download it, click the image below, it will lead you to our extension on the Chrome Web Store. Download the tool for free and you will always have it close in your browser every time you need free translation. If you’re not interested to use an extension for your browser, you can use our free translation tool online, right here on this page. Simply copy the text you need to have translated and select the target language. Our tool will automatically detect the source language and will translate the text into any language you want. It’s also simple to use, it is available around the clock, and there are no expenses attached to it. This is a machine translation and is not perfectly translated. If you want to work with a professional translator, please GET a 5 MINUTE QUOTE. Do you feel like you do not actually need a translator as much as general translations of small phrases that you have come across in a language you don’t understand? Do not worry; you are not the only one. There are many like you who feel like they mostly do not need a professional translation services to help them translate conversations. They just need a little help in pushing things forward. They are here to see if there is a free service available that will help them with day to day regular phrases that they come across while trying to chat with other people in a foreign language. Well, we are here to give just this service. Our free translation tool online is a tool designed to help people who don’t speak English look up phrases in English easily and speakers of English understand and try and communicate in foreign languages as easily as possible. We provide this service so that you can enjoy the regular day to day translation with ease and have fun with many languages in your international dealings. We want you to have full exposure to the languages that you deal with fee of cost. Not every word in a foreign language has to come with a price tag and a quote. Much of international translation can come without much baggage attached to it. You should have this access so that you can do your business dealings and everyday social interactions with an international audience without any disturbance or strings attached with simplicity and ease. How does our free translation tool online work? 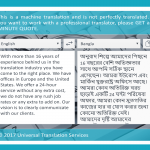 Universal Translation Services has its own free translation tool available that can be used as an extension in Chrome or as an addon in Firefox. We are here to help you get the gist of any document written in a language you don’t understand by using our new translation tool completely for free! Why do you need our free translation tool? Because you are out in a foreign country and do not need a translator, but just someone to translate a few phrases so that you can use the translation for communication. Or because you just came across a phrase that you need to be translated, but you do not want a proper translator; or just because you want to translate something from your own language to another language. All of these are valid reasons for us! You can use our tool for free for just about anything, except professional translation. What does our translation tool offer? Language Detection; if you see content in a language that you do not recognize just copy paste the content in our tool and it will detect the language for you and translate the content as well. Instant Translator: it’s not perfect, but it will give you the gist and the basic idea. You will copy paste your content into the software and it will translate the content for you. Virtually All Languages; our translator can translate to and from virtually all the languages in the world. Do you want our translation device with its cool language range and great capacity on your own Google Chrome browser? Do you wish you could have our translation capabilities ready at hand so that you can travel around with them? Well, we are here to allow you to do just that. We have just created a translation extension for Chrome which you can download and add to your browser from the Chrome Web Store. This handy little device will help you in business dealings as well as making new friends. In the top bar of your Google Chrome, this little icon will blink. It will give you the ability you translate whatever you want translated from and into any language and allow you to have fluid discussions in foreign languages. We are here to ease your translation problems that arise in day to day use and give you solutions that are effective, high quality and free of cost so that you will have the solutions at the tip of your fingers. It feels like you have your own translator in your computer with capabilities that will astonish even the best translators. 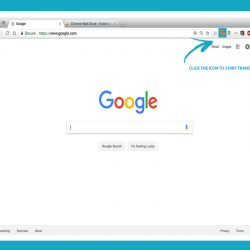 Our translation extension for Chrome has an incredible language range with various languages available to choose from and is accurate in its translations. Our translation extension for chrome is a reliable tool when conducting self-translations for light and informal use among peers and friends. It helps in business conferences where both parties are expressing themselves in other languages and have many complex ideas to express. It makes regular online discussions in professional settings easy and fluid as you find many and diverse words, phrases and idioms to express all the ideas that come to you. Our translation extension for Chrome is free to use by anyone needing to have a quick way to translate words and phrases. Once installed in your Chrome browser, you are only a click away from having it translate for you. It will help you even if you don’t know what language has been used: simply paste the text in our free translation tool and it will auto-detect the source language for you! Are you aware of our free translation tool that will translate content in between languages on the go! Have you always wanted a version that was compatible with Firefox Browser?! Your wish is our command! Universal Translation Services is here with the best translation tool that you will find in the Firefox Browser. You prefer Firefox over Google Chrome for many reasons, then you cannot use Google Translate as it only opens in Google. Do not worry; we are here with our own translator for you to utilize. 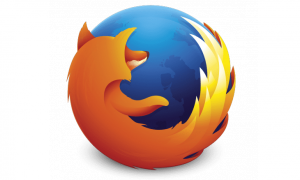 Our Firefox free translation tool will translate your content into any and all languages without any problems. Yes, we come bearing the gift of an extension of our Firefox free translation tool. We are doing so because we are sure that you will need a translation tool in your browser so that you do not have to open the browser over and over again in order to get the translation that you need. So check out our free translation addon for Firefox and enjoy the translation of all the content that you have always been serious about and want to see translated without any problems or complications. Need Professional Translation Instead? Get in Touch! Are you still in need of a more sophisticated, clear and professional translation that you can use in legal circles with professional legal offices? Worry not, we, Universal Translation Services, have a great online translation system. 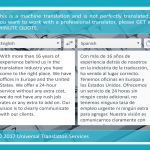 Here, we take your translation needs and give you a quote on how much it will cost you to have a professional team translate for you. Once both parties agree on a price, we start translating on your behalf and provide you with an accurate, professional translation that can be effectively used in business or wherever you may need it. We also provide certified translation for immigration which is guaranteed to be accepted at USCIS and all other legal bodies for all kinds of reasons. 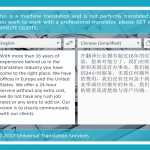 Do You Need Human Translation Services? Our translators are certified from the authority in translation in the United States and we take great pride in the credentials of our staff. Our staff reviews and re-reviews every single document that passes their assignment desk carefully to see whether they missed any aspect of translation in their work. They are here to help you translate the best way they could to have translations that could work for both clients and the government agencies that are dealing with translation so that they can have results that make them happy and make their monetary expenditure justified. We are an international translation agency with more than a hundred languages included on our roster. We have a professional team of translators and many tools for localization that programmers develop with translators that help translators and novices alike in achieving excellent translation results in day to day translation endeavors. We are experts in online translation and help many all across the globe achieve the translation that they so dearly need. Our translations are a name in themselves and our customers are strong businesses who came back to us over and over again for dealing because they know that we are the best name in the translation businesses. Many travel agencies, immigration lawyers and other similar agencies send their clients to us and vice versa for translation projects as they know that our work is up to the mark and will live up to their expectations and our reputation. We are experts in government related translations, especially immigration documents that are so frequently translated these days and we are here to make sure that these translations are catered carefully in accordance with the legal office that they will be presented to. Universal Translation Services is a translations provider with 17 years of experience under its belt. We have translators in over a hundred languages available 24/7 with years of experience and appropriate credentials. Our rates are affordable with various discounts being offered all across the year for a variety of reasons and seasons. We are the best translation agency available online and our track record is exemplary in translation quality and professionalism. Our linguists are professionally trained native speakers of the foreign language who can produce expert translations with no effort at all. They have great experience in translation practices and take joy in helping those who need assistance in their translation related needs. We understand that translation packets are expensive and not always needed. We have many ways to help individuals who need translation of text, but not accurate and not in any official capacity. We also have pages devoted to the ways in which language translations work and how they are affected by the naïve languages and their culture. We have an ever-expanding research on translation practices going on our website that increases and enhances every day. We are devoted to the great discussion on online translation and we are very interested in strengthening this raft in our time here on the web with our great team of translators. We work day and night, including during the weekend to give you a translation platform that caters to not only your serious translation related queries, but also pushes through to help you with small translation needs that arise for you every day in your dealings with the international community.